What is Audio Noise Reduction? Regardless the microphone quality, there is a high chance that your recordings will have some background noise. 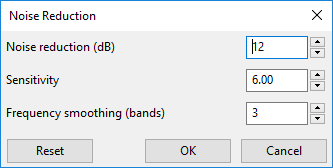 So, ActivePresenter 7 provides a new feature called Audio Noise Reduction. Generally speaking, it’s a process of removing noise from an audio track. Noise reduction can reduce constant background noise such as tape hiss, electric fans or hums. In general, the procedure to use the Audio Noise Reduction feature is to get Noise Profile, then reduce the noise. Step 1: Get Noise Profile. Select the range that contains only background noise. Note: If the selected range is too short, the app cannot get the Noise Profile. You must select a minimum 2048 samples, or about 0.05 seconds at 44100 Hz sample rate. Click the arrow button on the Audio Noise Reduction button (1) and click Get Noise Profile. After that, Noise Profile will be stored in the program. When you close the program or replace it with another Noise Profile, it will be lost. Note: If there are different types of noise in different parts of the audio track, you should repeat the process several times. Pick the profile for the first type of noise, reduce the noise for it, then pick the next type and reduce that until you satisfy with it. After getting Noise Profile, you can apply Noise Reduction to a certain range in the audio track or to the entire file. Select the range or the audio tracks you want to apply Noise Reduction. Noise reduction (dB): Control the amount of volume reduction (0 – 48) applied to the identified noise. Higher values reduce a higher amount of volume reduction, making the noise quieter but can distort the audio track. Keep this control as low as possible. Sensitivity: Control how much of the audio will be considered noise. Greater sensitivity will remove more noise but can damage the track. Keep this control as low as possible. Frequency smoothing (bands): Spread the noise reduction into the specified number of neighboring bands. Smoothing can make the desired audio less clear, so set the value to 0 if your desired signal is strong and the noise is low. Click OK to apply the effect and close the dialog. If the Noise Reduction effect doesn’t work as well as you expect, you can press CTRL+Z and try Noise Reduction again with different settings. Note that you don’t have to get a new Noise Profile if you think the existing is good enough. Tip: Sometimes, the audio track doesn’t have any part that contains only background noise and you cannot get the noise sample. In that case, you can create a recording made in identical conditions that contains silence only, then use a noise sample from that to reduce noise from the recording you want. That’s all. Use the Noise Reduction feature in ActivePresenter 7 to enhance the audio quality used in your projects. Remember that there are many useful tutorials about editing audio tracks on the tutorial page, feel free to check it out.